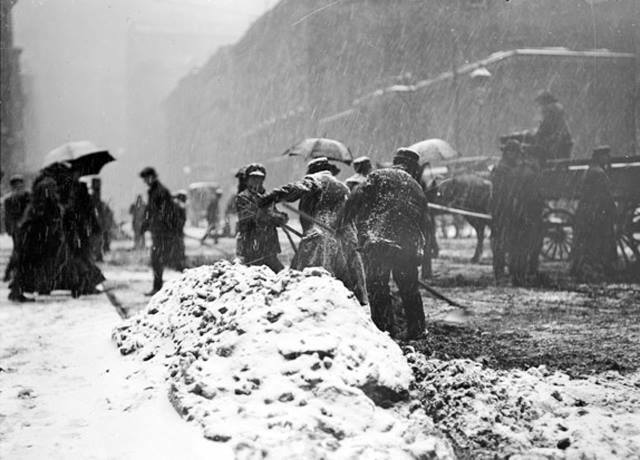 February 21, 1912 -- The worst February storm in 18 years brings business in Chicago to a standstill. Service on the Illinois Central suburban line is shut down at 1:30 p.m. after a northbound train crashes into the rear of a milk train, leaving stations crowded with passengers. The downtown hotels do a brisk business, taking in workers who are unable to find a train home. For the first time in the city's history the street cleaning bureau gives up the fight in the face of 52-m.p.h. winds that left workers lost in white-out conditions and horses wandering around in Grant Park. Policemen at crossings in the Loop are kept busy picking up people who have fallen or been blown into drifts. Members of a funeral party for 12-year-old Rose Myrtle Drautzburg, with her schoolmates acting as pallbearers, start for the Grand Trunk station at Forty-Seventh Street at 9:30 in the morning and wait for a train until 4:30 p.n. when they are informed that the train is cancelled. The estimate is that over 30,000 men are temporarily thrown out of work because of the weather.